People want free stuff and things for not doing much. One way to earn on the web is searching through the Bing search engine. Bing Rewards program (now known as Microsoft Rewards) is a free program from Bing that rewards you for using their search engine service. You can earn Bing reward credits by searching on a mobile device, on a desktop, on a surface tablet, Xbox, and more. 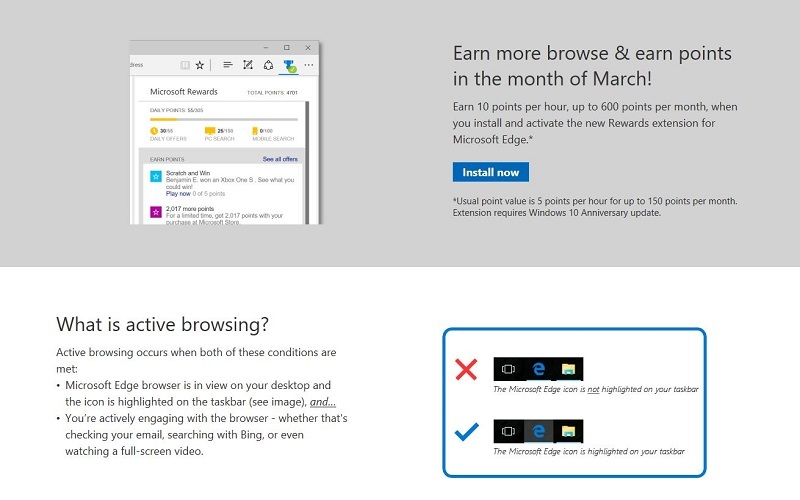 You can earn more Bing reward points for using Microsoft Edge, taking surveys, checking your emails for points, completing quizzes, and much more. In this blog post, I will show where to sign up for Bing Rewards, the level differences, some hints about how to earn extra points, and more! Here is the link for Bing Rewards sign up. 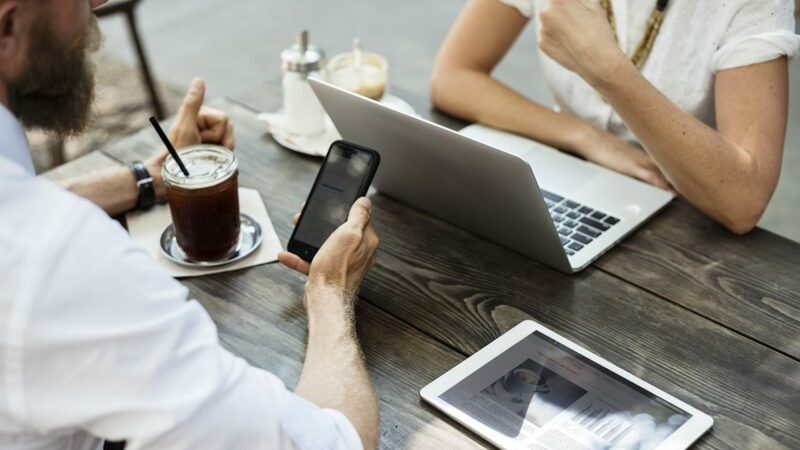 From there, you put in your Microsoft Account email that you use, or you can put in an email address like Gmail, outlook, yahoo, or something else. When you begin, you will default to the level one category. There are two levels which I will get into more detail below. The benefit of being level two member is that you will get discounts on prizes like 10% off Starbucks gift cards. The goal is that you need to achieve 500 points each month to keep your level two status. If you are looking for a complete breakdown between the two levels, you can check out this picture below. The Bing Rewards dashboard acts as your main hub. This dashboard is a good place to check on any daily offerings. As you can see below, I like to set a goal for Bing Rewards Xbox Live Gold Membership for 12 months. If you think of the math for a second, I am getting a 29 dollar membership that would cost 60 dollars if I paid for it myself. In my opinion, I can get Xbox Live for free in about three to four months and then have it for the next 12 months. Bing points can be used for Xbox 360, Xbox One, and Xbox One X gifts. There are many ways to earn credit points, but I want to break down how to get more Microsoft Rewards points per day. As a note, you will see a different amount of points to earn every day, so it is hard to say how many points you will get each day. I have been a rewards member for a while and can say that if you do all of your searches everyday, you should be able to get close to 10,000 or more points per month. Some of the things I want to highlight in the picture below is how many points I can earn today. The number two reflects that I have earned all 150 points today for PC searching, but I can still earn more for my mobile searches. Let’s begin with PC searching and how to earn points. For every two searches you do on a desktop with your Microsoft Account, you will get ten points. These searches can be any combinations of searching for videos, images, normal web searches, and even Cortana results. 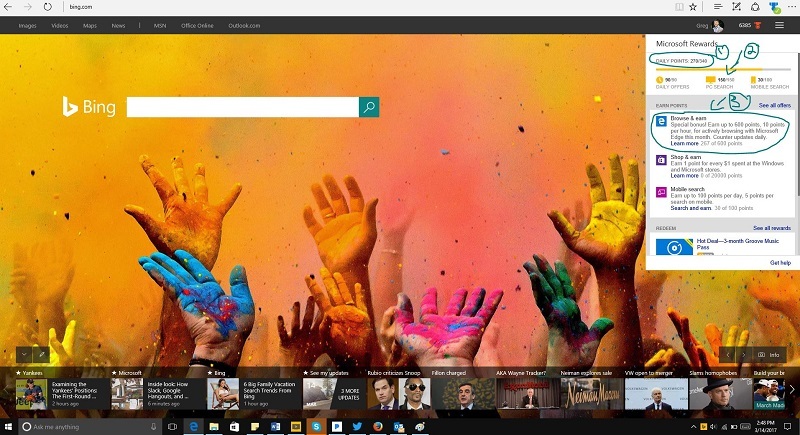 Microsoft Edge is the new web browser for Windows 10 and Microsoft really wants you to use this. Since that is the case, they will give you an extra amount of points every month for something that they call active browsing. If you want to learn more about the privacy concerns you can click here. At one point the reward was 1,500 points, so this number will change all the time. Just like on a desktop, you can earn points by using your mobile phone. Same as before, you need to sign into your account to collect the points. You can use the Bing app for iPhone, Android, Windows Phone, or you can just use whatever browser you want and do your searches on it with Bing. 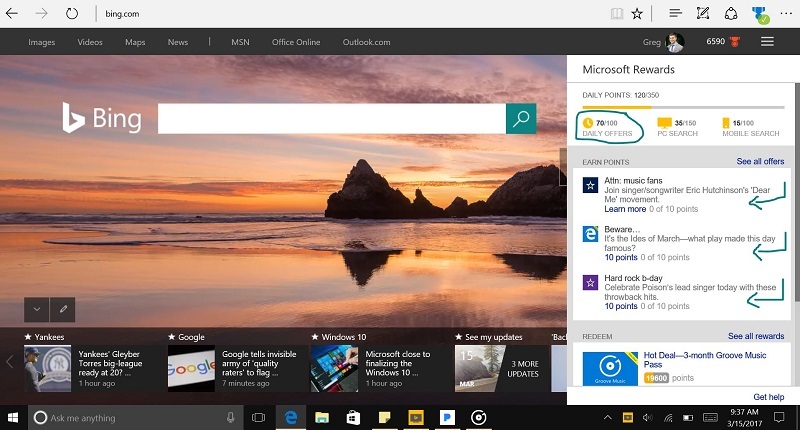 Microsoft Edge is now out for iOS and Android devices. As of now, Microsoft is giving more Bing rewards points if you use Edge for your mobile searches, so you should take advantage of this. 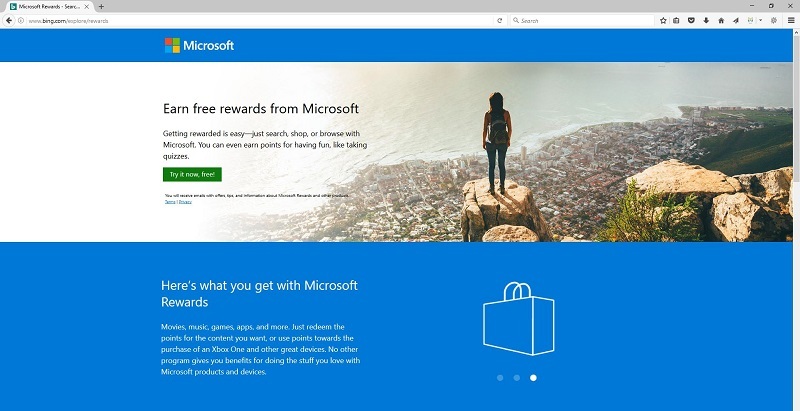 Once you sign up for Microsoft Rewards, you will receive emails with more ways to earn bonus points for Microsoft products. For example in March 2017, March Madness was in full swing and fever. In honor of this, Bing has emails that have quizzes about March Madness. 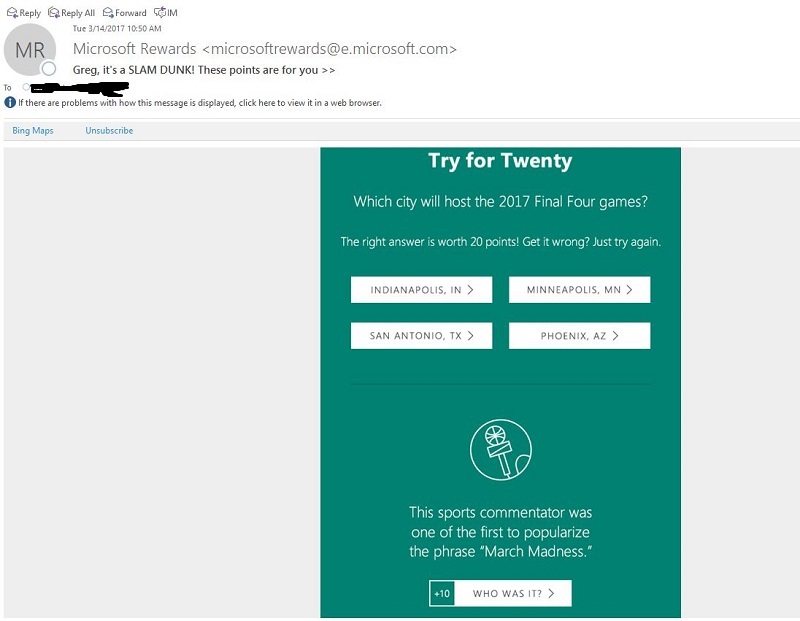 Clicking on the email will come up with extra points to learn more about March Madness and receive extra Microsoft Reward points. In that email example above, I had a quiz that I took. Don’t worry if you don’t know the answer, you can guess until you get the right answer. You will see that you got the correct answer when you see a screen like this that says you got the answer right. Another way to earn more points is to click on your rewards medal to see the daily offers. The offers are simple to earn points for. 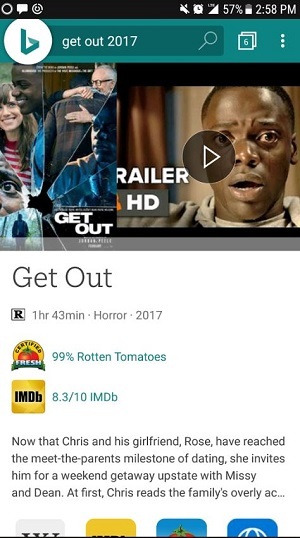 You can do this on both desktop and mobile, but you click on the icon that says 0 out of 10 points and you will get rewarded ten points for clicking on that. Here is an example of thirty more points I can earn to my daily rewards by clicking on these offers. Whether you perform 30 searches or more, you will always have daily offers. Microsoft rewards will give you additional bonus points for consecutive days searching with Bing. The further you keep your streak alive, the more bonus points you can rack up. This picture above illustrates how I lost my current day streak, but I can unlock 45 additional points if I’m able to perform all of my searches for three days in a row. Every month, Microsoft will reset the counter down to zero and allow you to earn points for shopping on the Windows Store. It’s their way to urge you to use their store to rent movies, rent music, pay for apps, or even buy bigger things like computers. Whatever it is, you will get points for whatever you buy. The exchange rate is for every 1 dollar you spend, you get 1 point. The exchange worth is the same as 1000 Xbox reward points come out to 1 dollar. Starting in June 2018, you can earn more points by using your Xbox One. The way that this will work is with your Xbox Live account. You will earn points when you buy games on Xbox, rent movies, and so much more. 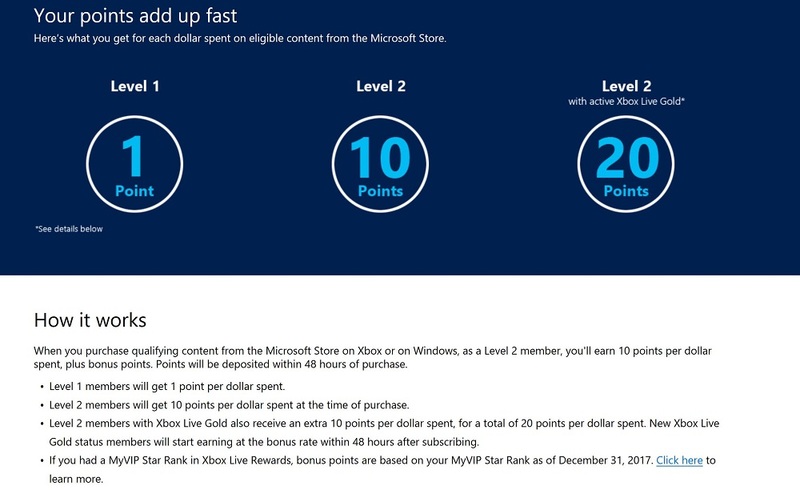 For each dollar that you spend, you will earn 20 Microsoft Points. What are the Prizes for Microsoft Rewards? 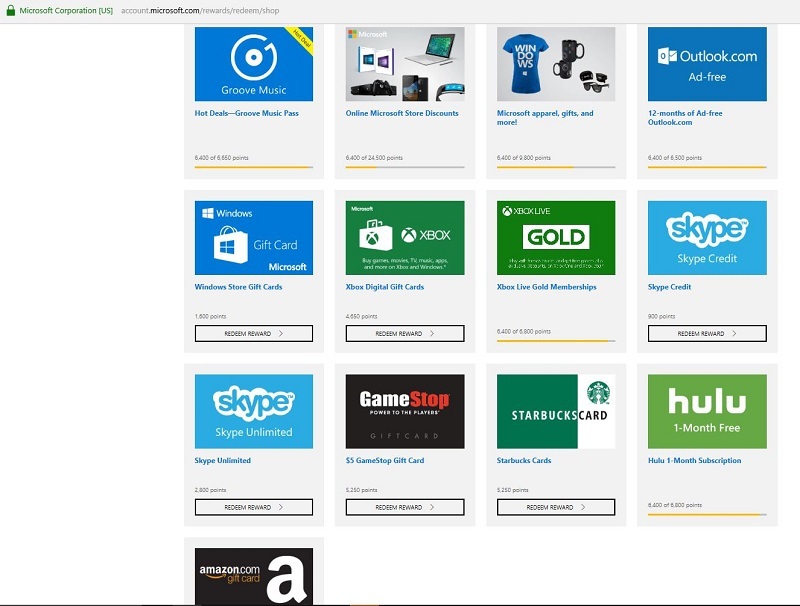 The rewards page includes items like Amazon gift cards, Starbucks gift cards, Burger King, Sephora, Xbox Live Rewards Membership Cards, Windows Microsoft Store credit, Skype credit, and much more. Don’t worry if you don’t have the same prizes as me. Microsoft continues to update the rewards, so that you will get a variety of different offerings. My girlfriend did not have Starbucks for a few months, but now has that reward, so sometimes it takes a few months for everyone to see the prizes in their rewards account. How Do you Redeem the Points? 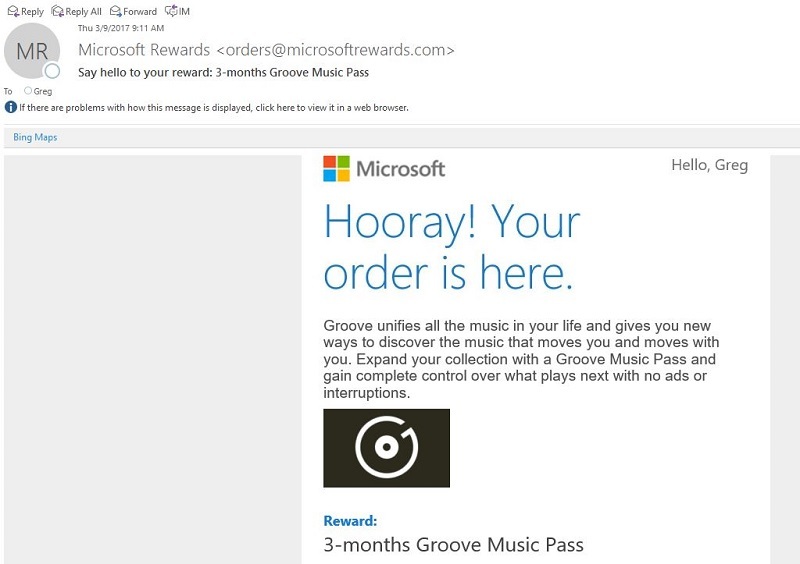 Let’s say you finally have earned credits to get that Microsoft Groove pass. You click on the redeem rewards section and you are brought to a screen like this. Redeemable credits can be used for a plethora of rewards, so feel free to check out the section often to see what’s new. Does Bing Pay You to Search? Microsoft is committed to getting more users to use their search engine. Bing ads need a large audience to get more advertisers to advertise on Bing and Yahoo. If advertisers see that Bing is large enough, they will spend more money and resources to advertise on the engine. With Google being a lock on Safari, Chrome, and FireFox, Microsoft needs to pay people to switch from Google to Bing. Let’s face it; Google is a verb that is part of everyday life, so Microsoft has an uphill battle. To get more people to use their engine, they are paying people to use Bing. Is Bing Rewards a Scam? Throughout this blog post, I’ve outlined all the ways to earn credits in exchange for rewards. Microsoft wants more people to use their search engine, so they have to get creative to encourage people to use their search engine. There are many reward programs out today trying to accomplish that task. Getting people to use their service over a rival may require an incentive to help persuade a user to choose that service over another. Bing Rewards is not a scam at all, it’s just Microsoft’s way to incentive people to search more with their search engine and improve their market share. If you want to join and you are outside of the U.S, I would recommend leaving a comment at Bing Listens.